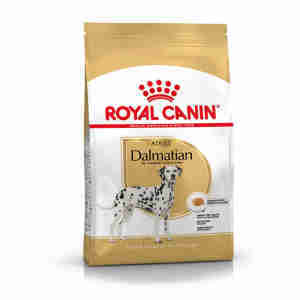 Royal Canin Dalmatian is a complete food specially made for Dalmatians over 15 months old to keep their bladder healthy. Some breeds of dogs are more likely to have problems that others don’t and this is true for your Dalmatian. This breed’s more likely to get bladder stones. A bladder stone’s a build-up of minerals in your dog’s bladder and can be very painful. It can stop them being able to go to the toilet, or make going to the loo hurt. Because Dalmatians are more at risk from bladder stones, a special diet like Royal Canin Dalmatian can help to keep their bladder healthy and your pet happy, playful, and fun. There are a few signs to watch out for if you think your dog might have bladder stones. They’ll have more trouble going to the loo, so watch them during walkies. Their wee might also be cloudy, or have blood in it. If you do spot any of these symptoms, make sure you speak to your vet as soon as possible. If your vet does recommend Royal Canin Dalmatian, make sure you check the feeding guide so they get the right amount. protects your dog’s skin, which makes their coat soft and shiny. As bladder stones are more common in Dalmatians, this food uses special proteins that help to stop them forming. Bladder stones are actually made from lots of little crystals, so the proteins in the food prevent these crystals clumping together. Your Dalmatians beautiful coat is one of things that makes them unique, and Royal Canin Dalmatian helps to protect your dog’s skin and fur, too. The food has lots of fatty acids, and these make your dog’s coat shiny, soft, and great to stroke! Taurine, another special ingredient, helps to keep your dog’s heart healthy. This means you can enjoy loads of runs in the park, or energetic games of fetch. Taurine also helps keep your dog’s eyes healthy – killing two birds with one stone. COMPOSITION: rice, maize flour, vegetable protein isolate*, animal fats, egg powder, wheat flour, maize gluten, minerals, vegetable fibres, hydrolysed animal proteins, fish oil, soya oil, green tea and grape extracts (source of polyphenols), marigold extract (source of lutein), hydrolysed crustaceans (source of glucosamine), hydrolysed cartilage (source of chondroitin). ADDITIVES (per kg): Nutritional additives: Vitamin A: 22500 IU, Vitamin D3: 700 IU, E1 (Iron): 42 mg, E2 (Iodine): 3.3 mg, E4 (Copper): 7 mg, E5 (Manganese): 67 mg, E6 (Zinc): 209 mg, E8 (Selenium): 0.12 mg - Technological additives: Pentasodium triphosphate: 3.5 g - Preservatives - Antioxidants. ANALYTICAL CONSTITUENTS: Protein: 22% - Fat content: 18% - Crude ash: 6.4% - Crude fibres: 2.8%. *L.I.P. : protein selected for its very high assimilation.